On the morning of the last day of the year we woke up in a hotel, somewhere north of Ax-les-Thermes, attacked a rather sad little breakfast and headed outside. In the evening we should arrive to Barcelona, but since it was a drive of only a couple of hours, we were in no hurry. 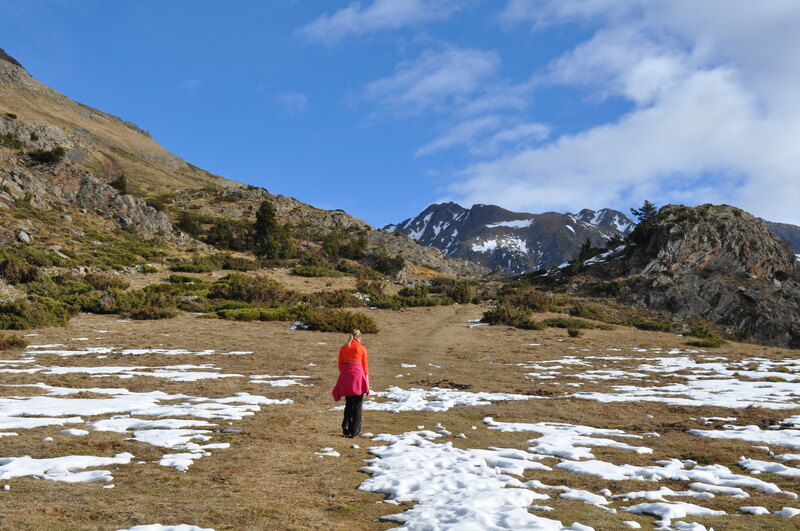 There was a nice small walk in a valley between high peaks, a couple of small lakes and a tiny mountain village. I was feeling just about as sporty as a wet mitten, so I was more than happy to have a mild walk, with next to no climbing to do. The beauty in the details. 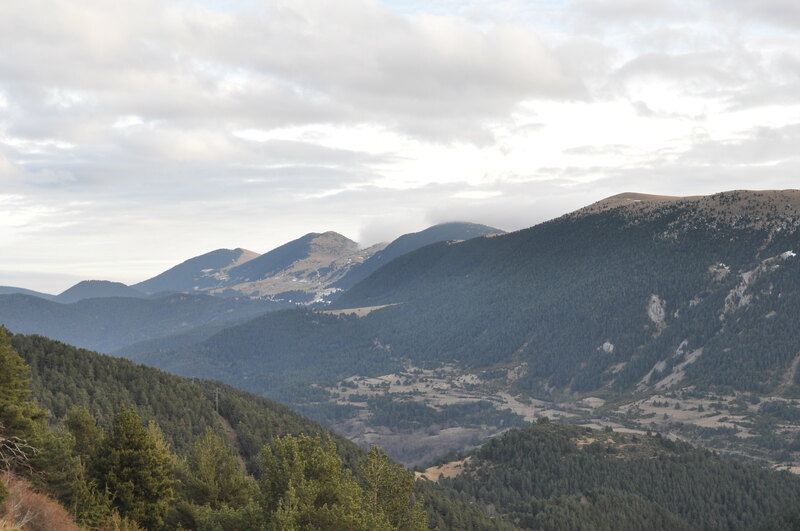 The valley dived in between the peaks and ridges of Carlit and Font-Frède, offering a very nice view. The trail brought us quickly a bit higher, offering a nice view over the frozen lakes. The climbing ended at a waterfall, alongside which we started our descent towards the lakes. 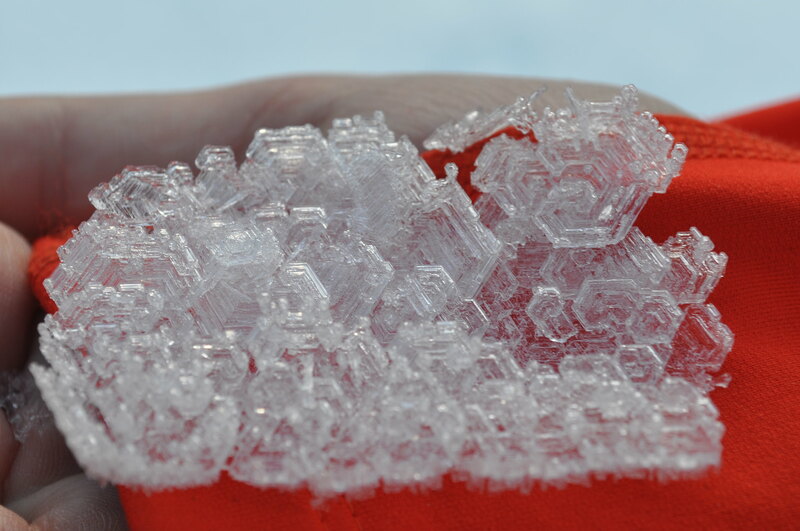 The snow in the valley bottom was formed with uncommonly large crystals. They give a beautiful shimmer and chink when you walk through them. Before heading down south to Barcelona, we stopped for lunch in a very characteristic old village. The houses made of nature stone, and faint smell of smoke from the heating of houses, is somehow very warming and welcoming combination. Lunch down and the navigator set to avoid toll roads, we headed up to a mountain pass, that takes you through the Pyrenees from France to Spain. That road, N-260, climbs up almost to 1800 meters, and the view is amazing at times! The serpentine corners are sometimes also slightly scary to drive through. We reached the outskirts of Barcelona at 6 in the evening. Our humble hostel was in Badalona, a short metro ride away from Barca. Before heading out for the fireworks we cooked the most romantic new years dinner I have ever had. Not really. 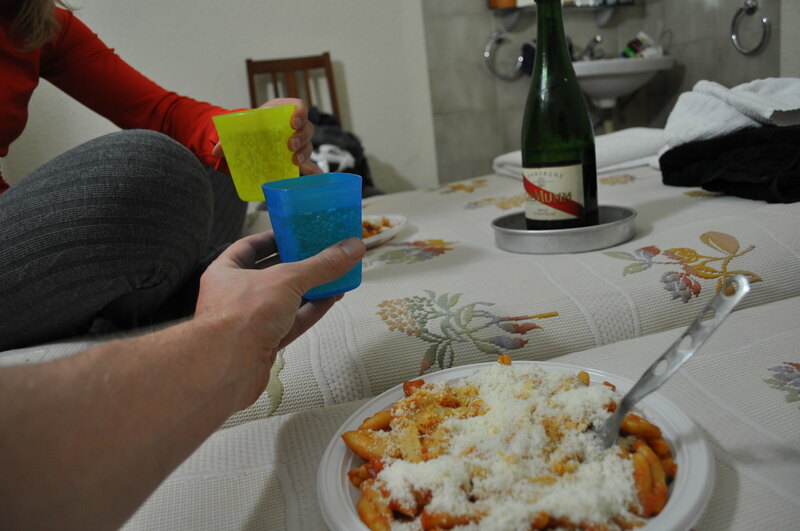 Pasta in a bottle sauce, heated on campingaz, sided by a bottle of Mumm was rather peculiar dinner for the moment. Not that Waffle or I ever cared too much about etiquette. The more unconventional dinner. Never forget the champagne! We headed for the metro. Equipped with our camera and a tripod for it. We stopped to take a picture from a land mark, so that we would find back to the hostel a little bit easier. A pair of police officers saw that, stopped and started questioning us on what we were taking pictures of and why, where were we heading and all that. The encounter resulted us taking the camera and the tripod back to our room and going out to Barcelona with no decent equipment for photos. Oh poop. The fireworks ended up being quite a disappointment too. We were packed in a huge crowd to the central square, looking at the show from the city palace. The fireworks started at midnight, as is proper, and ended 7 minutes later. Many stayed at their places, waiting for something more, but nothing came. Odd and disappointing, when you had expected something spectacular. Even the party across the city seemed to have troubles getting started. That guy stayed out late? Well, never the less. We still had the next day to explore the city. We had had next to no time at all to check what to see in Barcelona, so we wandered around rather blindly. 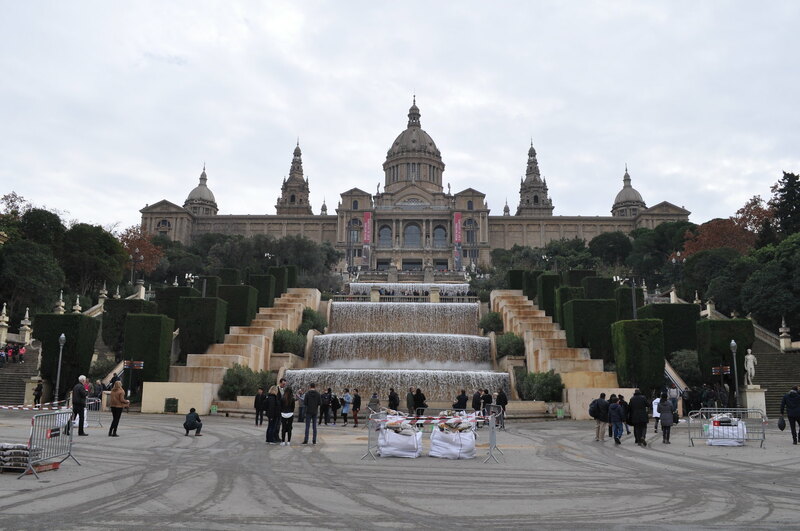 First we ended up in the harbor, from which we headed for the gardens of the Palau Nacional, the fountains of which are rather impressive. 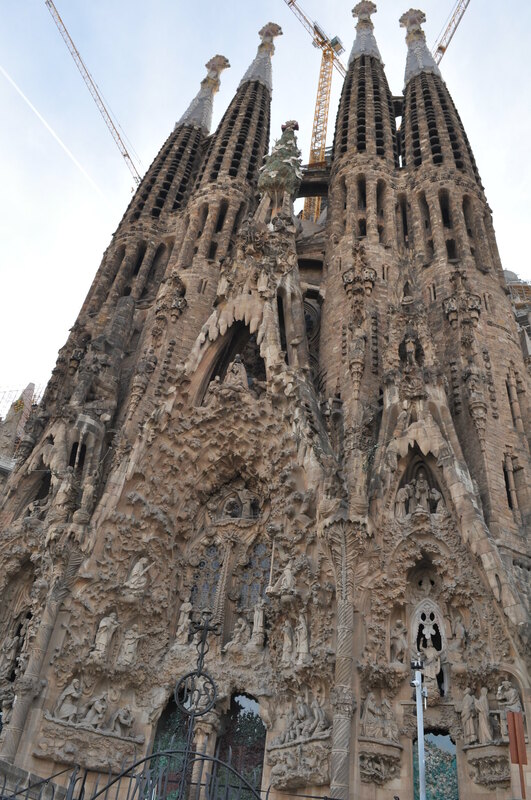 We carried on to the Sagrada Familia church, having lunch in between and enjoying the warmish winter day. 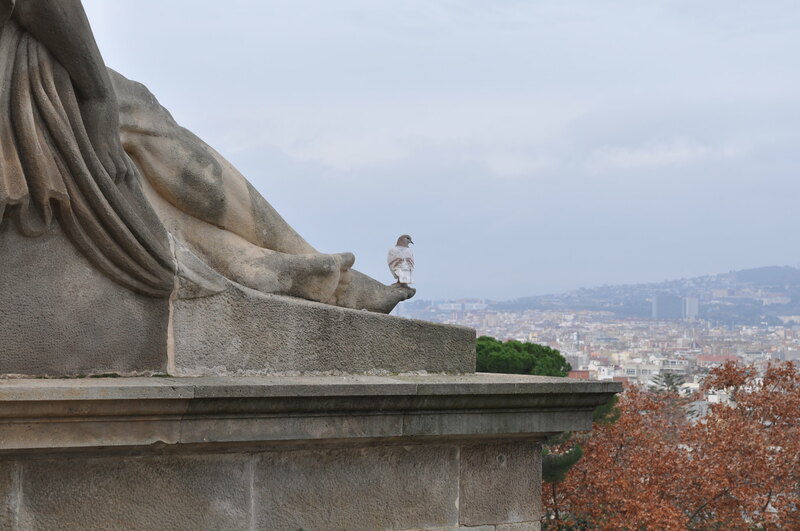 The monuments are impressive in Barcelona. It was a pity though, that everything was closed, thanks to the New Years day. So no visits to museums or anything like that. We noticed also, that city like Barcelona is impossible to visit properly without planning, especially if you only have a few hours to explore the streets. Our holiday was closing to its end. We picked up our car again and headed back to France. 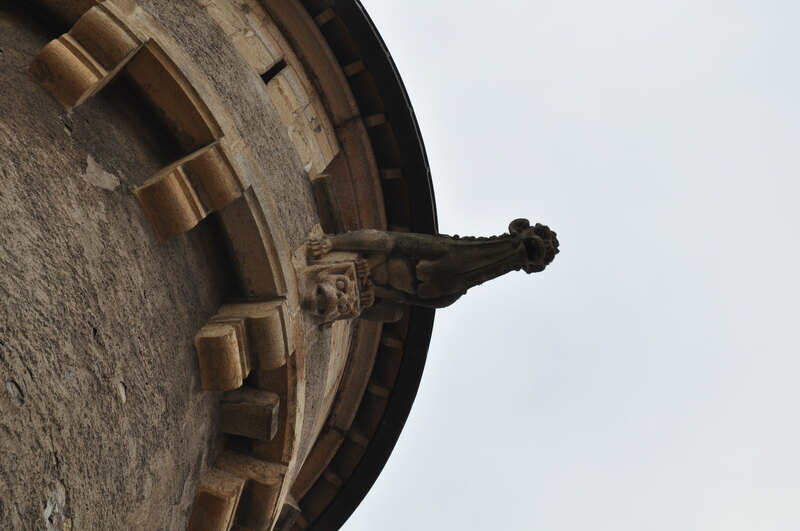 Our next stop was in the Auvergne region, somewhere in the middle of France. We left around 4, to make sure we had time to spare. Or so we thought. The French police had set up a border control thanks to the terrorist threat situation still going on in Europe. They had cut off the whole traffic on the border at the Mediterranean. We managed to avoid it almost all the way, by using a smaller department road, until out navigator betrayed us. 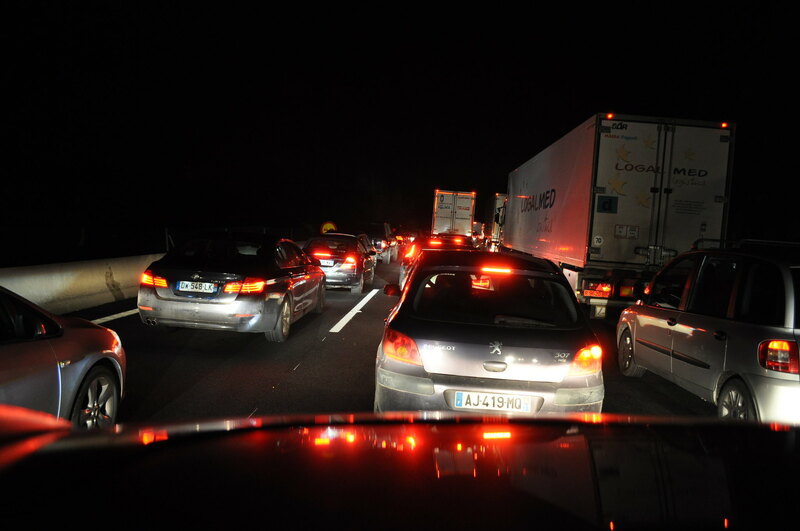 The last 6 kilometers from Spain to France took us 4 long hours, in a stand still traffic. 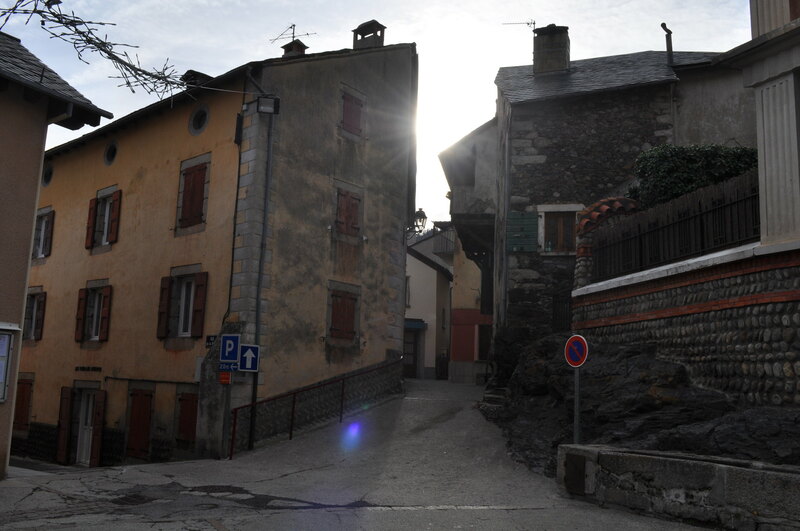 To our motel, close by Clermont-Ferrand, we arrived in the early morning hours, tired as hell. In the process we had climbed to the Central Massif of France, where we were planning on walking our last hike for the holiday. The area is known for its old volcanoes and we wanted to climb on top of one of them. See the craters and all that. We just needed to find a map. 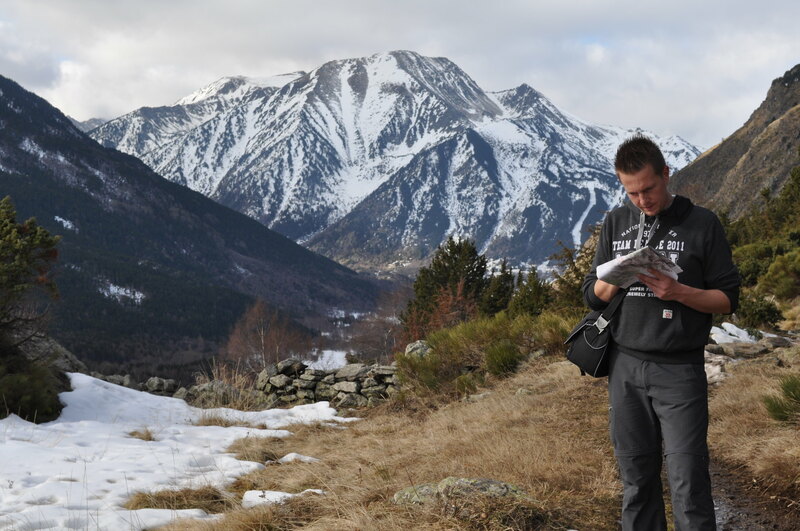 France, when it comes to hiking and maps, is a paradise. You do not need a specialized shop selling them. You go find a village, and a little bit larger Bar Tabac. They often sell perfectly good hiking maps. We did exactly that, went to a tiny village, asked from people, whether they know where the closest map selling instance might be. And got our map in less than half an hour. On a holiday. The people in those villages are just golden! Friendly and helpful to the extreme. And the villages themselves! So pretty! 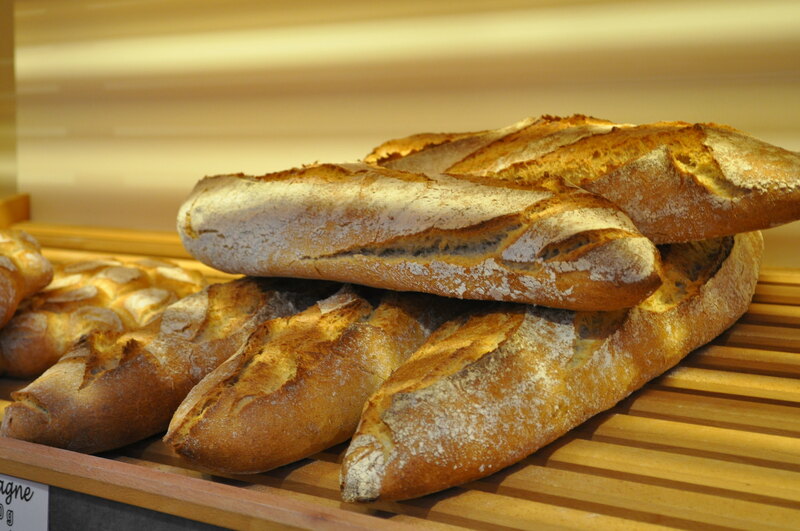 And the bakeries are almost impossible to pass by, the smell just forces your nose to go in. You just got to love France. These small villages. I like them so much better than large cities! A demon, fighting off other demons. 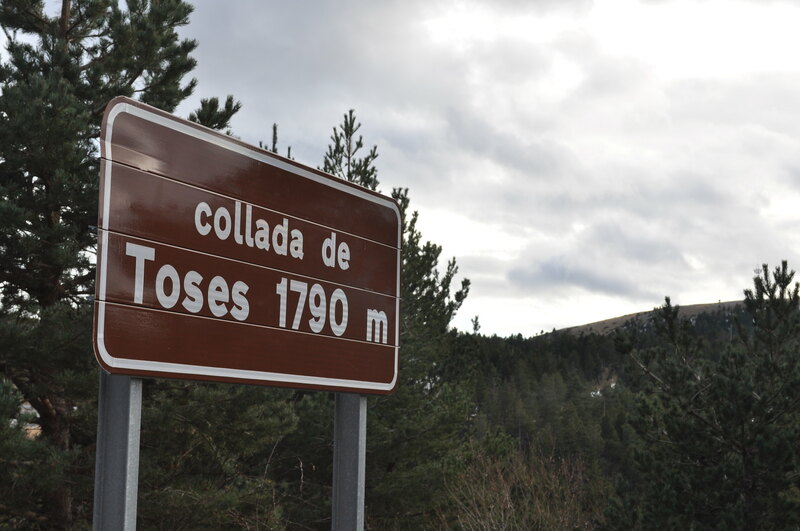 We picked our volcano from the map, and headed towards Puy de Domê. The weather was not on our side; We got slapped to the face by bucket full of water. 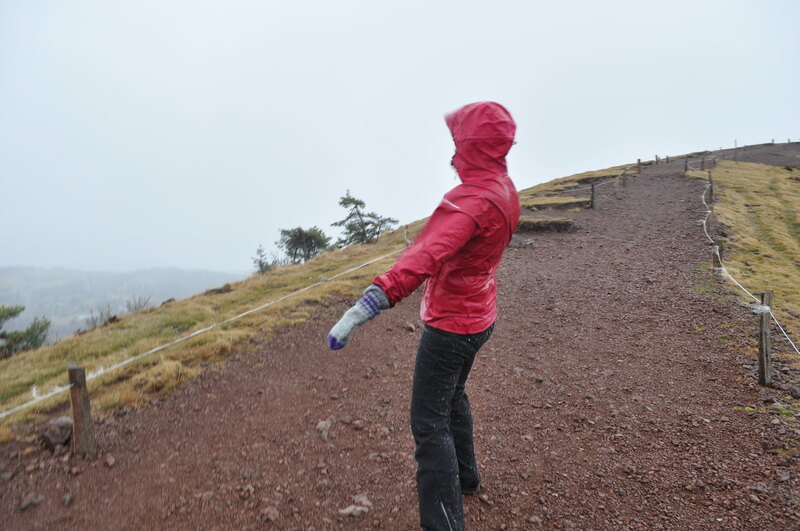 Puy de Domê was in the clouds, so we decided to head for its little sister; Puy Pariou. It was only a short hike up. The plateau of Massif Central is already at 1000 meters, so climbing a peak to 1200 is easy a task. We strolled through a beautiful forest, with dark greens and reddish browns surrounding the trail. At the peak we got a nice overview of the landscape over the volcanoes. They are sitting really side by side, looking prehistoric. It was not hard to imagine how they looked like back in the active days. 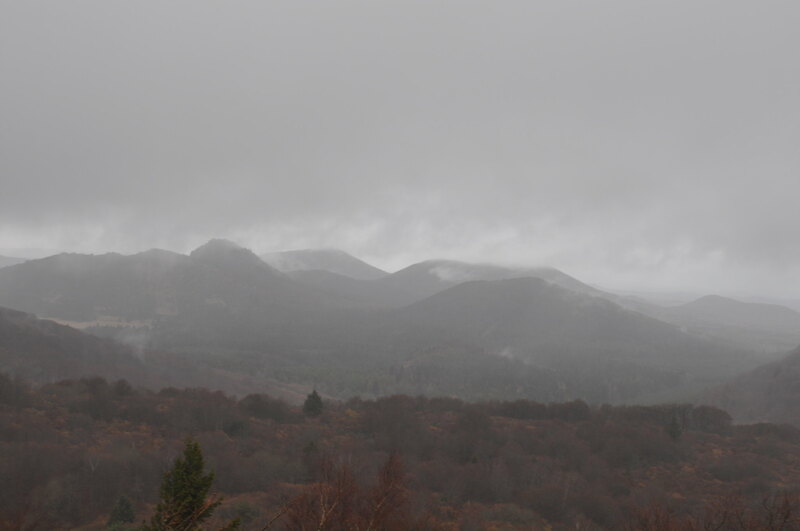 The moist was rising from their slopes, so that the whole area looked to be steaming. All these peaks are volcanoes! 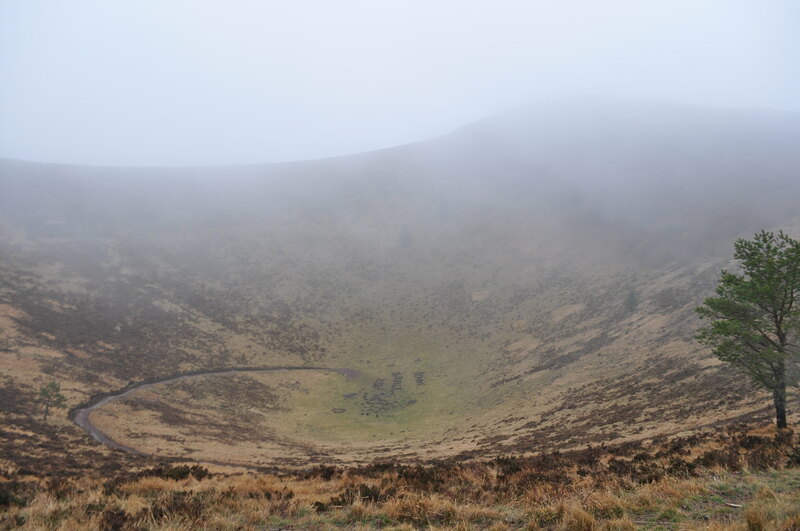 After dipping down to the bottom of the crater, we started to make our way back to the other side of the mountain. At that moment we got hit by a snow storm. 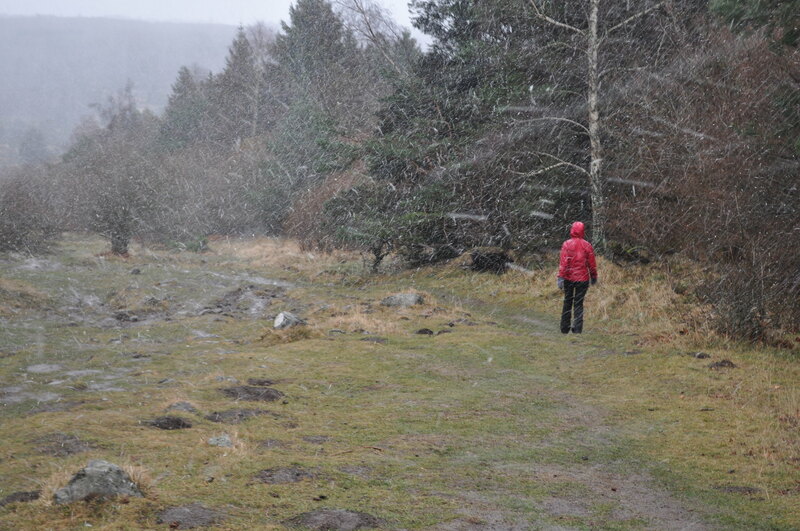 The wind picked up, trying to push us off from the craters edge, coating us with snow. The wind speed must have been close to 80 kilometers per hour! Back down at the car we were absolutely soaked and chilled, but happy about the experience. Those volcanoes, dead as they are, still have quite a character. That day we needed to drive all the way home, 800 kilometers or so. Before hitting the highway, we searched a store selling some local cheeses and surprisingly, also wine! Packed with goodies we took off, first towards Paris and then to the east, to home, slicing through the darkness of winter. We were slowly getting cramped onto the road with all the other people, returning home from the holidays. Soon we were closing up to the Paris ring way. Closest I have ever been to Paris, I got even a nice view on the Eiffel tower! On the ring way, I think, the essence of being a French, is strong. There can be chaos, a lot of it. But it is mostly very controlled chaos. There, the traffic is directed in a very complicated way, with highways merging and separating, crossing and zigzagging. But it all works. As long as you know where you are going. Wonderful. I am happy Waffle did the driving though. Early on Sunday morning, after 3500 kilometers, we finally reached Rupelmonde. Ready to dive into bed and say good bye to our road trip. 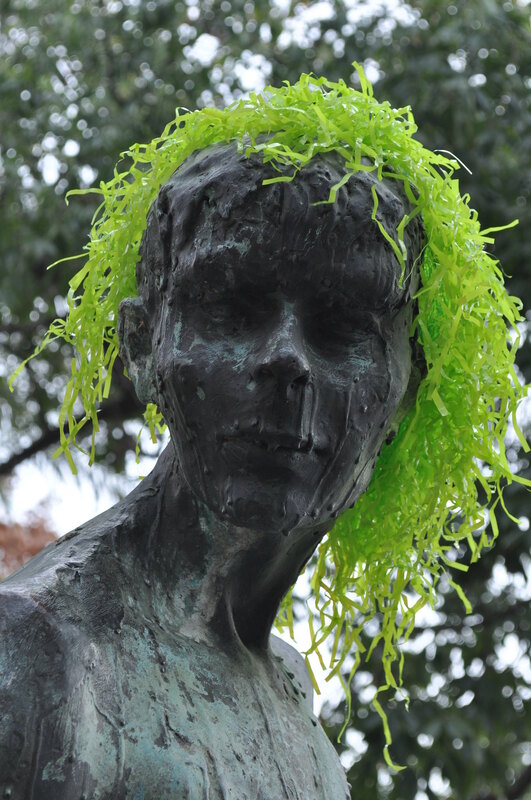 Taking in the challenges of the new year. As far as travel plans go, we do not have them yet, but I’m sure we are able to come up with something, pretty soon. Enjoy 2016, make the best out of it, my dear people. See you soon! And oh, oh! The pictures, they are here!